Description: Demi: Grid-Based Blog Blogger Templates is A classic theme with a timeless look. 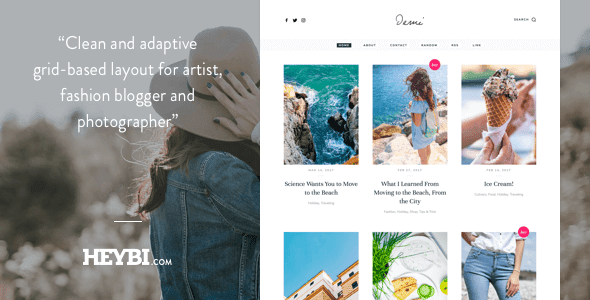 Demi is clean and adaptive grid-based layout for artist, fashion blogger and photographer. With “buy button” support, Demi helps you blog and sell stuffs —or promote your products— in a way that’s engaging, letting visitors enjoy your articles in a great way. Sell through Etsy, Demi allows you to promote your product or simply use PayPal button for direct transaction. Completely easy. Get free access to our custom widget (Instagram, Social media, Flickr), truly widget, easy to set up, no code, no headache. Custom share button, including “Tweet this quote”, to Engage With Your Readers via various social media platforms. Spice up your blog through the Theme Designer™. Change font, color, and yes…You can even re-adjust its layout width. All you need, nothing you don’t. From responsive layout to fully Mobile Theme support, Demi will adapt to any screen besides delivering great readability.